Tried-and-tested for pull in every direction. Welding onto machine parts or vehicle bodies requires special products that are ideally suited for the hanging of lifting and lashing parts – and PLE pewag profilift eta (grade 8) is one of them. 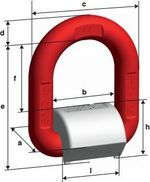 In fact, the product has made a name for itself among highstrength weldable lifting point, also for its integrated spring that keeps the ring in any position that is required. The product may be loaded in all directions. For load capacities in the permitted directions of pull (fig. Permitted usage and permitted direction of pull), please refer to the load capacity table.